Few ontologies in the ecological domain exist, but their development can take advantage of gained experience in other domains and from existing modeling practices in ecology. Taxonomies do not suffice because more expressive modeling techniques are already available in ecology, and the perspective of flow with its centrality of events and processes cannot be represented adequately in a taxonomy. Therefore, formal ontologies are required for sufficient expressivity and to be of benefit to ecologists, which also enables future reuse. 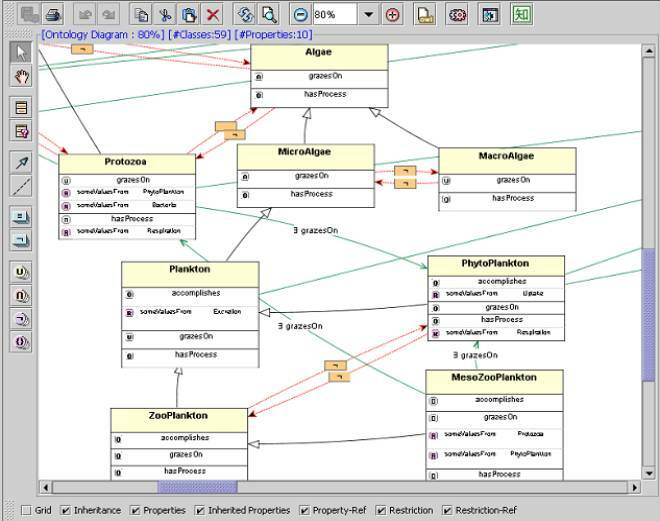 We have created a formal mapping between the software-supported ecological modeling method and software tool STELLA and ontology elements, which simplifies bottom-up ontology development considerably and has excellent potential for semi-automated ontology development. However, the conducted experiments also revealed that ontology development for ecology is close to being part of ecological research that through the formalized representation of the knowledge more clearly points to lacunas and suggestions for further research in ecology. This supplementary material contains the four tables corresponding to the different STELLA elements and their mappings to ontology elements for the Microbial Loop model . Some explaining notes for each element are included in the third column of each table. The MicrobialLoop ontology and the experimental Pollution ontology are available online as OWL file. A colour screenshot of a section of the MicrobialLoop using ezOWL is included in this supplementary material after the tables (here). Nitrate Yes - NAPO Dissolved nitrate. Molecules are non agentive and, however small, still physical objects. * Abbreviations in the second column are taken from the DOLCE categories . Table 3. From Converter to Quality or State. Grazing pressure "1" ST The top one is meant here, which is drawn outside the Microplankton window. Because it acts on a process (see Table 2), it is a 'parameter' affecting the process of grazing, hence may be a quality, because it is specifically constantly dependent on the entity it inheres in (grazing): at any time, a quality can't be present unless the entity it inheres in is also present. However, if there is no plankton the grazer may be grazing on something else, if there are no grazers, then the grazing pressure simply reaches zero. Thus 'grazing pressure' is always there, hence a state. Grazing pressure "2" ST Duplication of the converter symbol and attached name in the diagram. Table 4. From Action Connector to Relationship type. "2" Yes See the two converter entries in Table 3: The grazing pressure acts also on mesozooplankton grazing on protozoa N and on mesozooplankton grazing on phytoplankton N.
Figure 1. Section of the MicrobialLoop ontology; graphical representation with ezOWL.